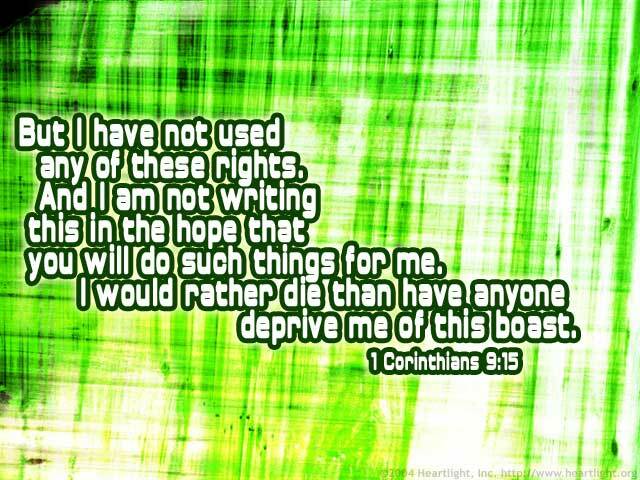 Paul was careful not to take support from the Corinthians even though it was his right as a minister of the Gospel. Instead, he knew their problems with generosity and showed them a great example in living for Jesus without obvious and instant reward. Oftentimes we must show our values before others will share them. Paul was a master at reading the needs around him and living in a way that was an example. Let's make a commitment to do the same! Father God and Almighty LORD, please give me the courage and integrity to live my principles in a way that is a blessing and example to others. Bless me, dear Father, with a life that makes a mark on others for your glory. In Jesus' name I pray. Amen.